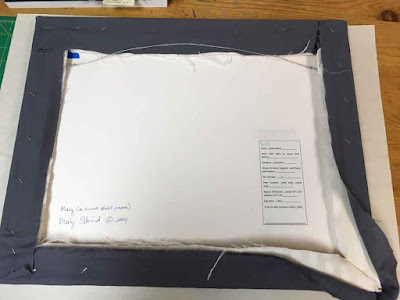 Almost every fiber artist eventually faces the dilemma of how to present a small work. If you hang it in all its soft, flexible glory directly on the wall, it can look sadly like a potholder or a placemat, especially if it's not part of a larger installation. 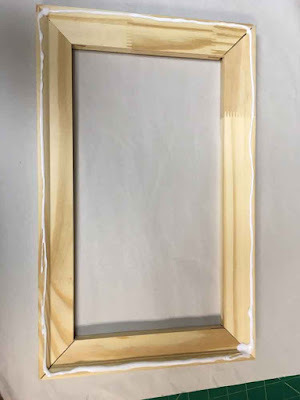 I had a question recently from someone who saw some of my small pieces on display and wanted to know how exactly they were mounted and framed. I described the process briefly in an email but it occurred to me that pictures are so much more helpful. I had a tapestry piece that needed to be remounted, in fact, so I took some photos and will walk you through the way I did it. As always, there is more than one good way; this just happens to be mine. The first thing to decide is how much bigger than the piece itself you want the mounting to be. 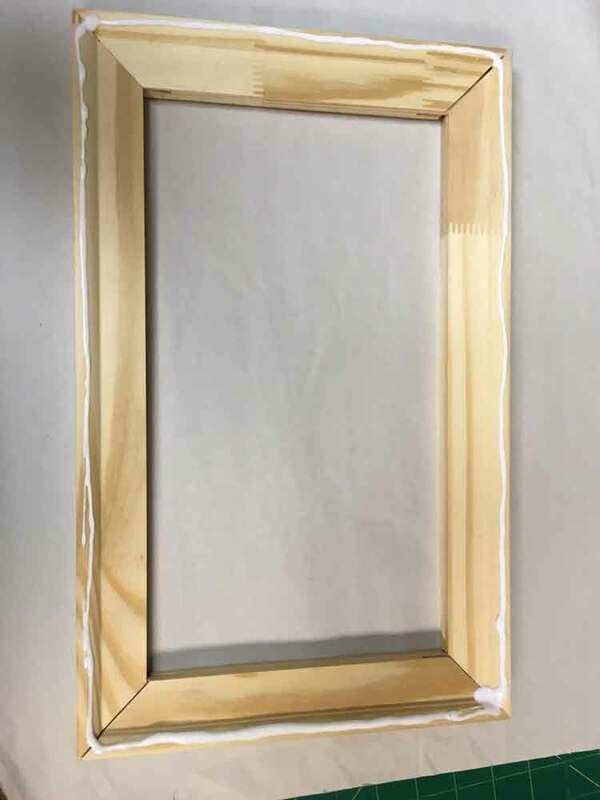 Some artists prefer the piece to match the size of the mounting as closely as possible, so there is no visible border or a very narrow one. I like the effect of a wider "mat" or border myself. 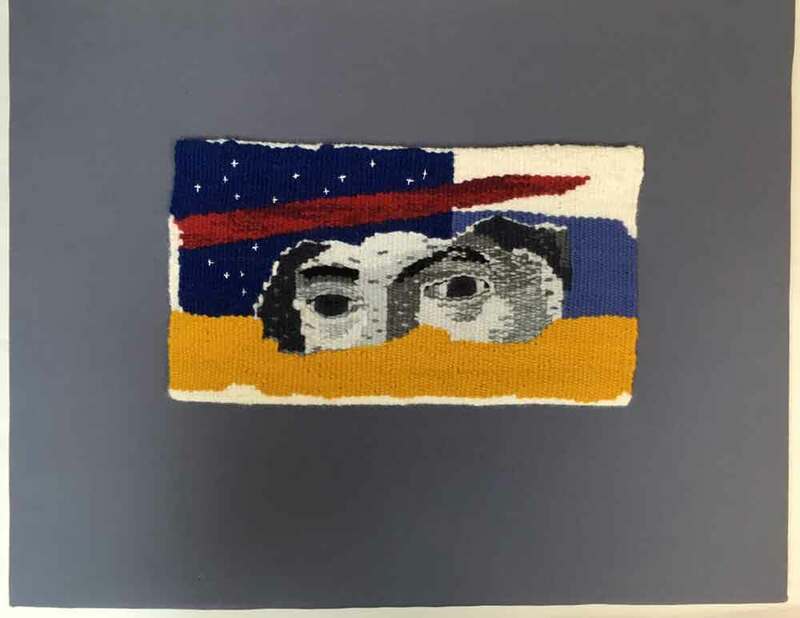 But in this case, I made the original mount, visible here as the gray border, over 3" larger than the tapestry itself all around, and that was too large. I decided a 2" margin all around, more or less, would be adequate. So I assembled some stretcher bars, two 10" and two 16", into a frame. 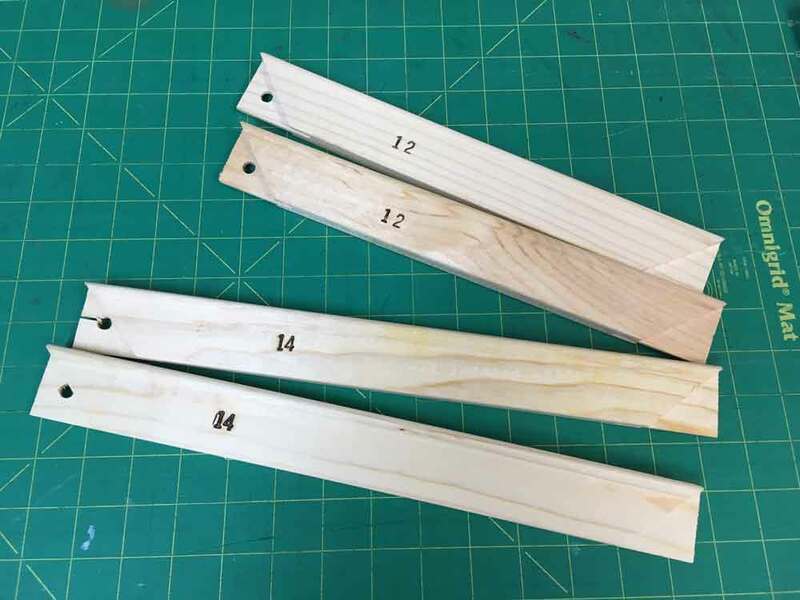 In the photo below I show stretchers of a different size, but you can see what to look for at the art supply or craft store if you're not familiar with stretchers. The corners are cut so they lock together. 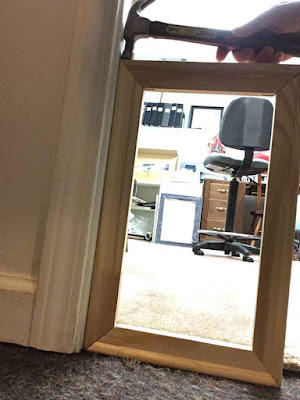 It helps to square them up if you place the frame in a doorway (assuming the doorway itself is a perfect 90 degree angle!) and hammer each corner into place. 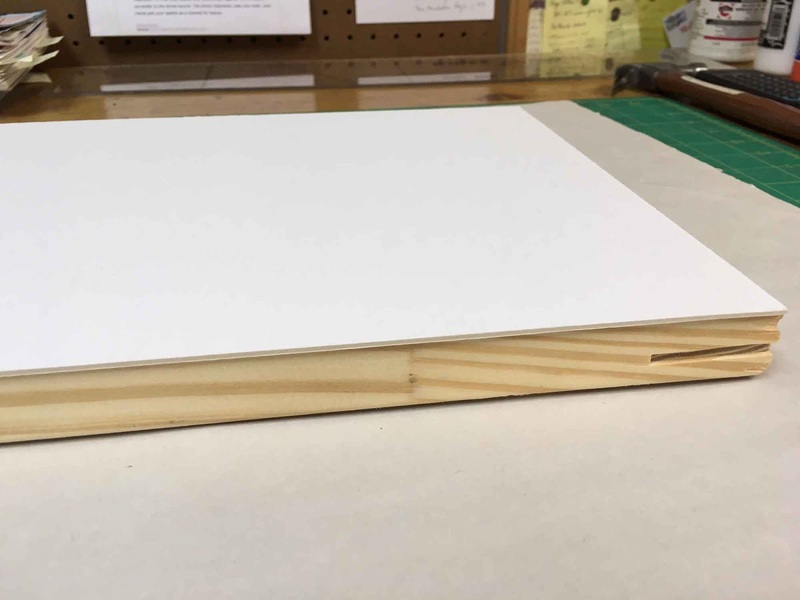 Then you want to cut a piece of acid-free matboard to fit the assembled frame exactly. 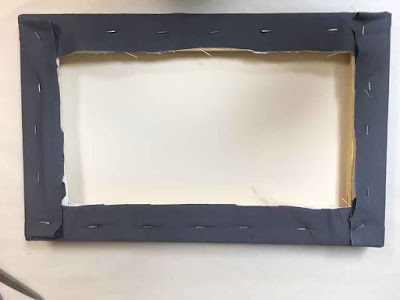 Run a bead of white glue around the front, curved edge of the frame and place the matboard on top. Place it aside to dry, weighting it with books or magazines. While the glue is drying, select the fabrics to wrap the frame in. I use two layers: something fairly substantial but smooth for the bottom layer like flannel (this fabric will not show), and something for the top layer that forms the border around the piece. 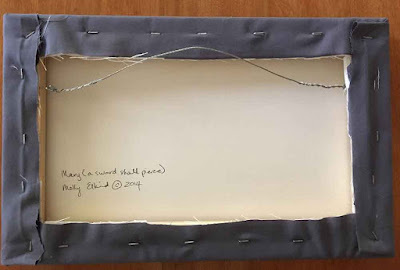 In this case I could just re-use the fabrics from the original mounting, unstapling them from the old stretchers. the original fabrics, with the bottom layer (striped curtain fabric) on top. Note the corners trimmed to reduce bulk. 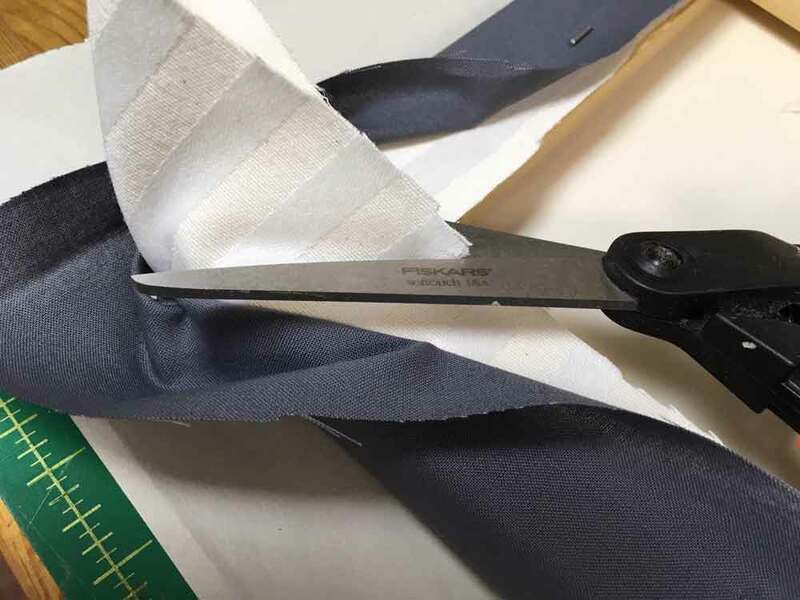 When mounting a new piece, you should cut the fabrics at least 2-3" larger than the stretcher frame all around, large enough to wrap all the way around each edge and give an ample margin for stapling. Once you've done this, stitch your piece as invisibly as possible to the mounting fabrics, centering it (if you want it in the center). Sometimes I will baste the two fabric layers together to keep them from shifting as I stitch. I measure and mark the placement of the tapestry's corners with pins, and pin the tapestry gently in place for stitching, once I have it centered. Here you can see the stitches when I pull back the edge a bit. 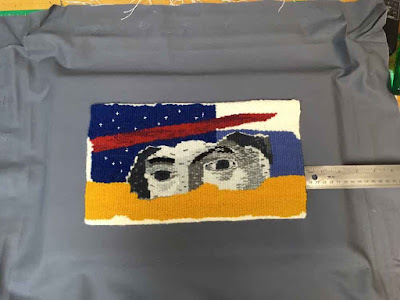 In this case, the stitching was already done, and the challenge would be to center the whole fabric/tapestry piece on the stretchers. Lots of measuring and remeasuring at this stage to be sure the piece is exactly centered. 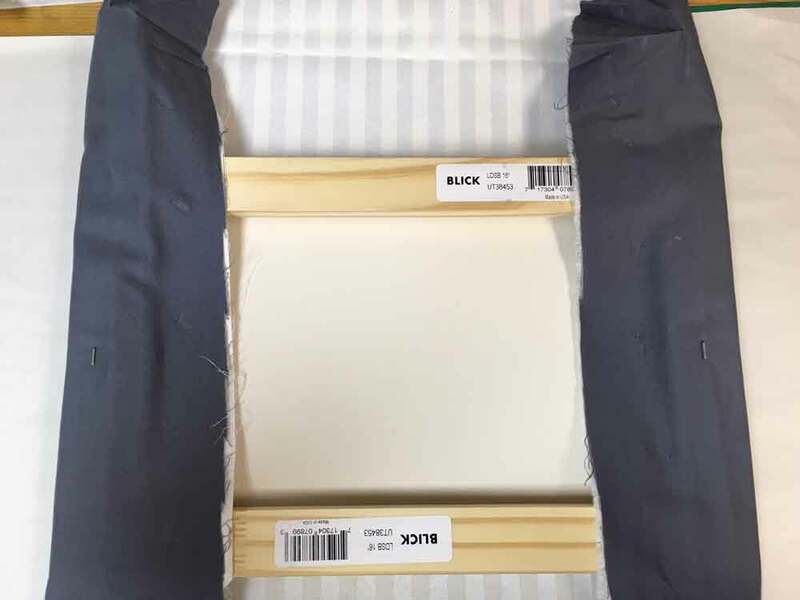 I carefully flip the whole thing over, holding the fabrics tautly in place around the stretcher bars without letting them slip off-center, and lay the piece face down on a clean sheet of newsprint. Now I'm ready to staple the fabric to the stretcher bars. Use a staple gun to staple the fabric to the center of one bar, then pull the fabric taut and staple directly across from the first staple, on the opposite bar. Flip the piece over to be sure it looks centered and straight on the front before stapling again. Then put staples in the center of the other two sides, again pulling the fabric with the attached tapestry as taut as possible. Continue stapling on first one side, then the opposite side, working from the center of each bar toward the corners, pulling the fabric taut each time, and flipping the piece over to do a visual check each time. Now, the corners. Lots of fiddling and fussing here, at least for me. 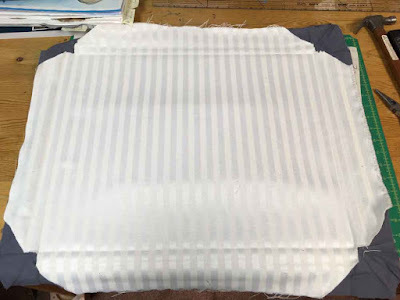 The idea is to reduce bulk as much as possible by trimming the under layer only. Fold the top layer out of the way. Miter the corner as seen below. 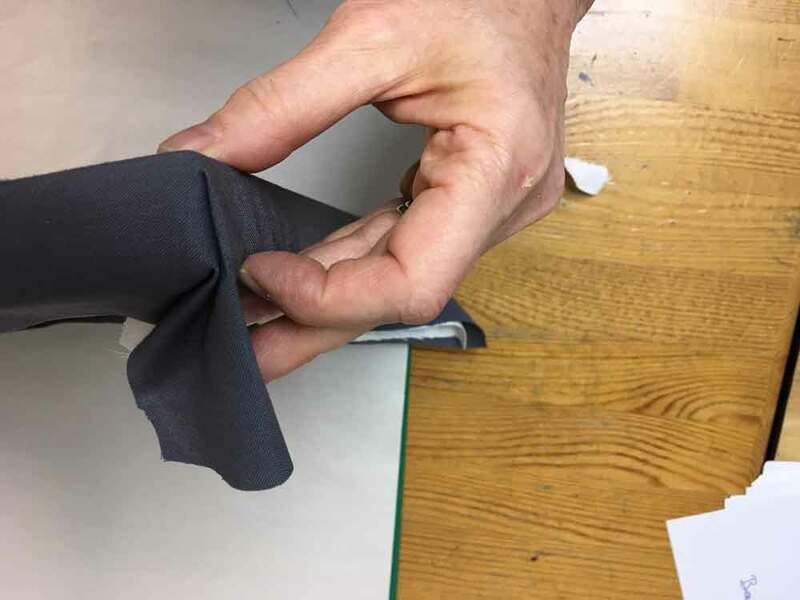 Then carefully wrap the both layers of fabric around to the back, deciding where you want the fold to be and keeping that consistent on each corner. Tuck, pull tight, re-tuck, flatten, fuss. . . and then staple all those layers in place once you like how it looks. 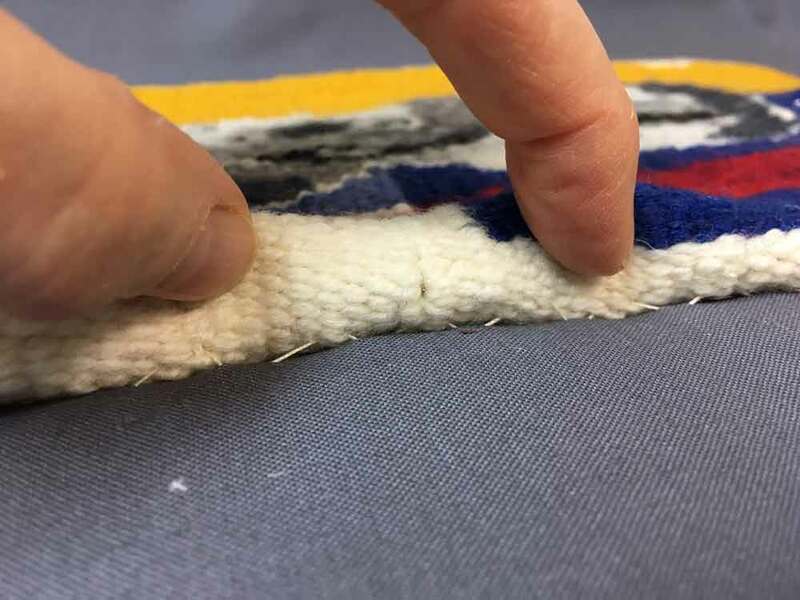 You may have to trim away some of the excess top layer, but proceed very carefully--don't whack away like you did on the under layer. 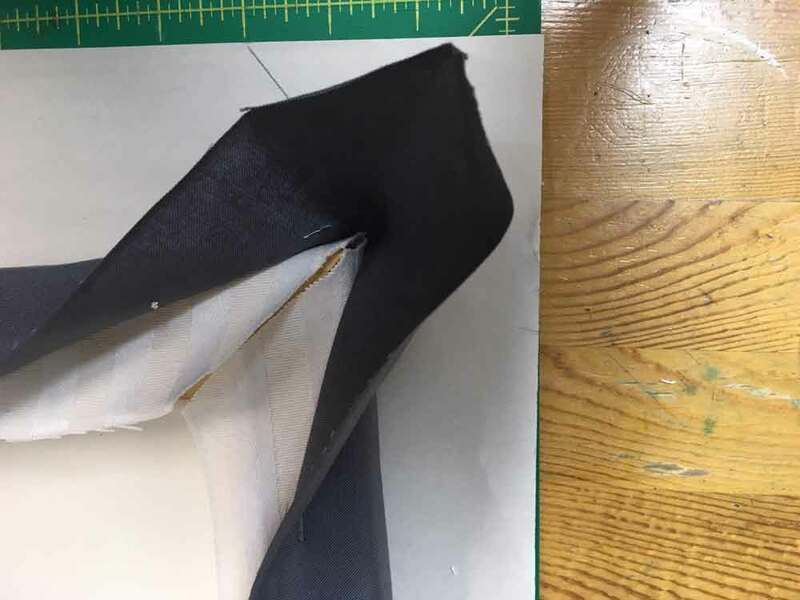 You need to leave a margin of fabric to avoid a raveling raw edge. The final step is to insert screw eyes and wire for hanging. Measure and make a mark the same distance down from the top on the two side stretcher bars; mine was 3" from the top. Insert your screw eyes into the inside edge of the stretcher bars at that point. Then run a section of picture wire between the two eyes, twisting each end back on itself for at least 2". 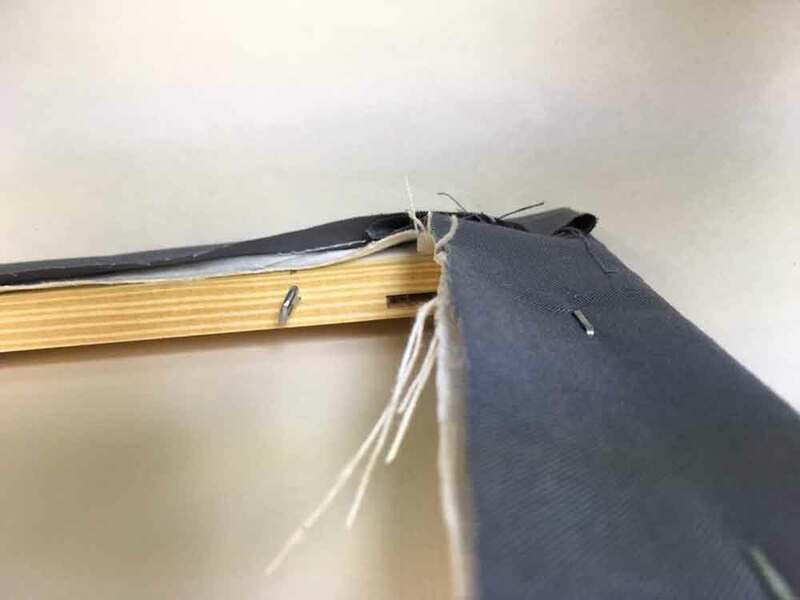 Those who are concerned about the piece's longevity would insist that the stretchers be coated with polyurethane before gluing on the acid-free matboard--and they would be right. I confess I usually skip that step. 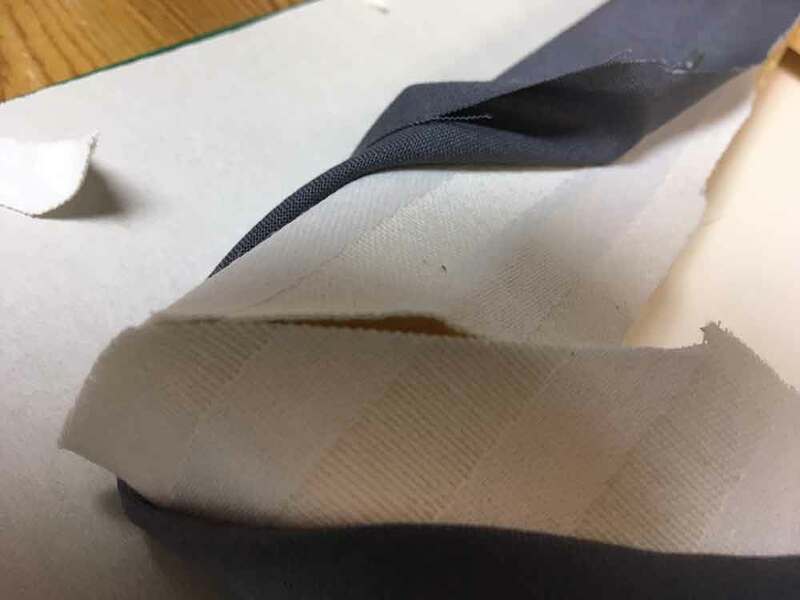 And those who are sticklers for detail would probably do something about the fraying raw edges of the fabric on the back. My feeling is, Hey, it's the back. 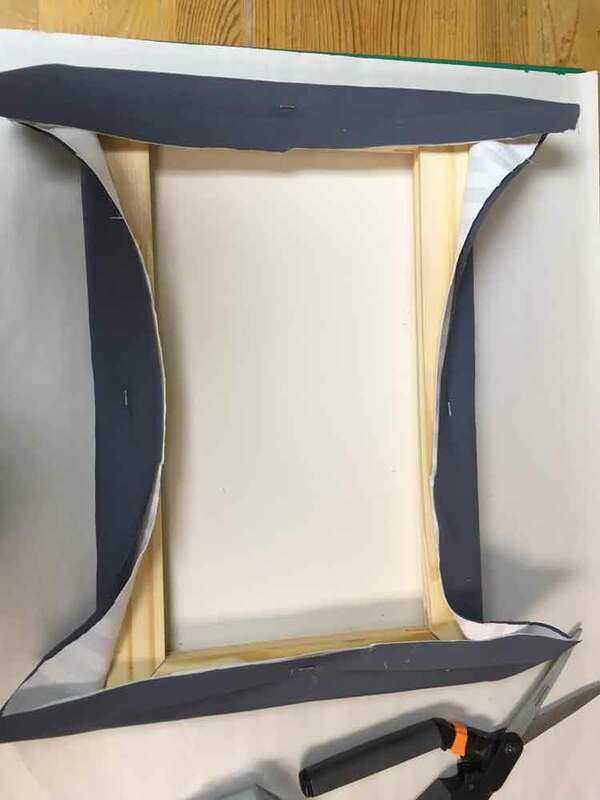 Does anyone care about the back of an oil painting? 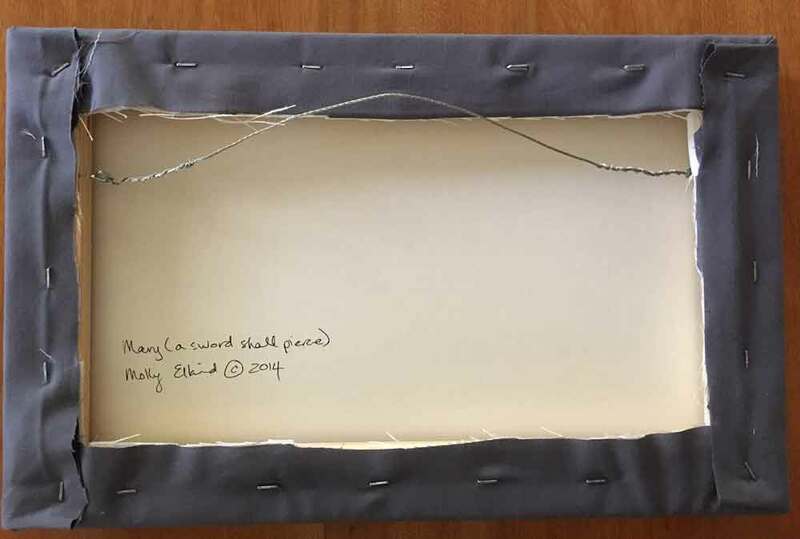 I do make sure to sign and date the piece on the matboard on the back, especially since this piece doesn't have my initials woven in. I hope you find this useful. I would love to hear about your own solutions for mounting small pieces. Please share in the comments! 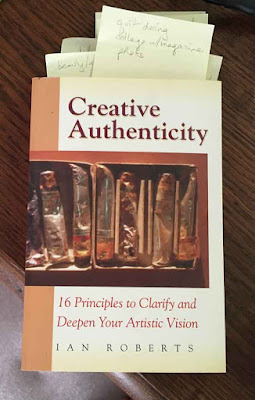 Well, for one thing, it's the title of this book I read a while back, by Ian Roberts: Creative Authenticity: 16 Principles to Clarify and Deepen Your Artistic Vision. As someone who teaches about the creative and design process, I read these sorts of things when I come across them. 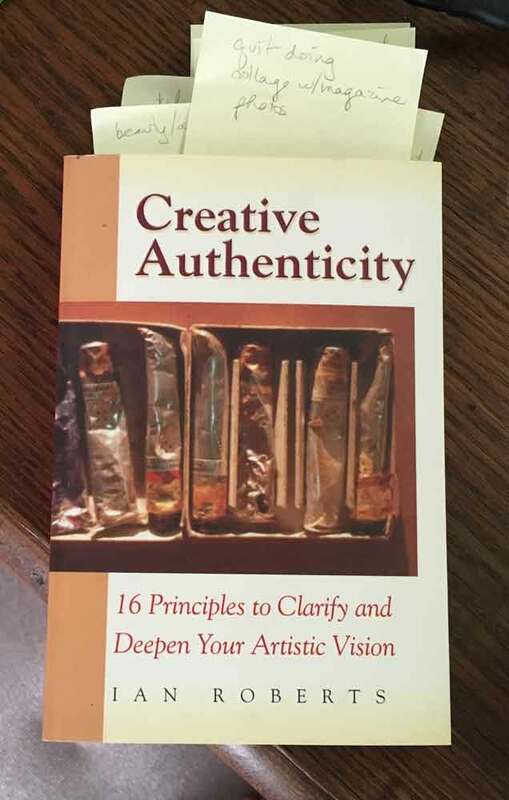 You can see from the number of post-its sticking out that I found much in this book to respond to. In the face of beauty, we are silenced, because beauty expresses silence. . . .A work of art is like a visual form of prayer. The depth of the artist's attention, the prayer, is what we respond to. . . . Our response comes from the power of the prayer that contributed to the making of the piece. The artwork lives. If we are left unmoved by a painting of the Virgin, it is likely because the artist was unmoved in the act of painting her. The subject matter is mostly irrelevant; it is important only as a vehicle for the artist's feelings. And this is the key to how much silence, consciousness or attention that the art reflects. (pp. 29-30). I have felt for a long time that the works of art that move me most are those that possess a strong sense of necessity, an inherent right to exist, a lack of contrivance or arbitrariness, a direct emotional appeal--and this comes from the artist's complete commitment, even surrender, to the piece. Do not be put off by Roberts' use of the word prayer in this context; what he really means is a quality of deep, heartfelt attention. As someone who has been working with imagery of the Virgin Mary lately, this particular passage hit home. I do worry that I am mining a tapped-out vein; that imagery of Mary is completely irrelevant today, a relic of a musty religious past that most people no longer feel connected to or moved by. It's true that it is lazy and artistically bankrupt to appropriate an image from another work of art wholesale, plop it into one's own work, and expect it to convey "original" meaning and emotion. That's just plagiarism. But it is also true, as Roberts elsewhere acknowledges, that artists have been inspired by other art for millennia. Presumably artists return again and again to the same symbols, subjects and stories because they feel they have something new to say about them, that they are engaging with them in a fresh, personal, contemporary way. Symbols remain symbols because they speak so deeply to human experience. Artwork can be "about a symbol" if that symbol is one that is meaningful to the artist. It can be invested with new, not just borrowed, power. You don't have to be a practicing Christian to find that images of Mary speak to notions of what it means to be a woman, a mother, and a daughter, even in the 21st century. Mary's shadow is very long. Yes, appropriation is a postmodern practice, and yes, it is done with eyes wide open, fully aware, even self-consciously so, of the weight and power of all of art history. In my view one hallmark of a serious contemporary artist is that he or she is aware, but not constrained, by that history. 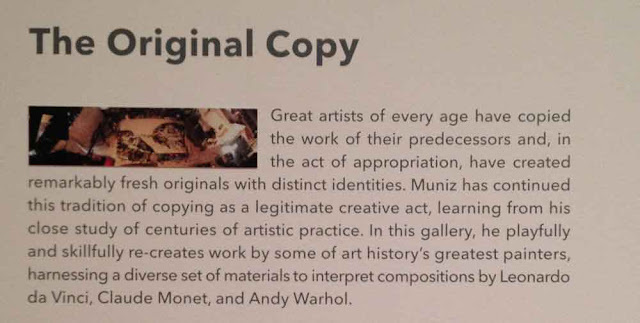 As Muniz' work demonstrates, art that employs appropriation can be witty, clever, insightful, and moving all at once. What do you think about appropriation? Have you ever consciously borrowed from other artists in your own work? PS. 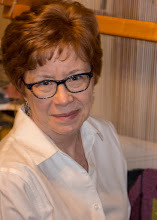 Social media update: You can now follow me on Instagram @mpelkind and Like my Facebook page, Molly Elkind Handwovens. Hope to see you there! Something that made me smile in the Milwaukee airport last month was this sign, right after I emerged from the body-scanning machine in security. Sorry the sign is hard to read; I was trying to take the photo with my old phone, unobtrusively, lest I bring down on myself the wrath of TSA. 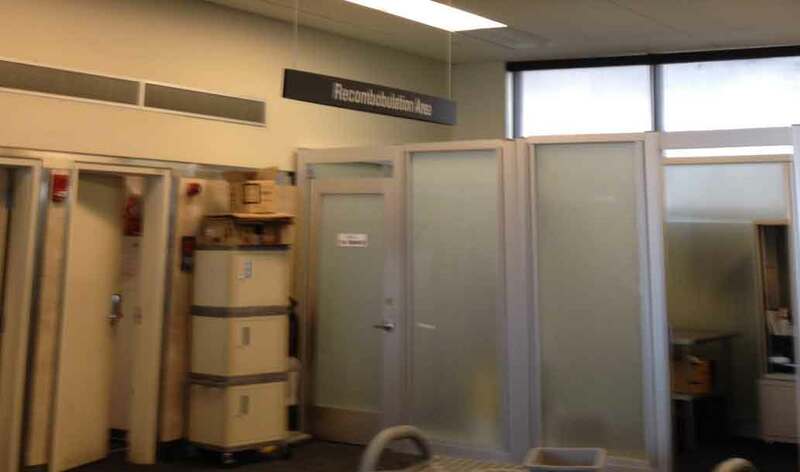 Though obviously TSA in Milwaukee has a great sense of humor. The official-looking sign says, Reconbobulation Area. What a great word to describe the place for fetching your valuables from the x-ray conveyor belt, putting your shoes and belt and jewelry back on and so on. Reconbobulation. That's been what's going on in the studio since I returned from Convergence too. 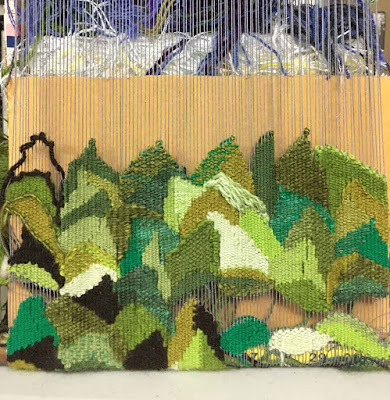 Reconbobulation: remembering, Oh yeah, that's where I was with this tapestry/sketchbook/this other tapestry/scarf warp/new class ideas. . . . Oh yeah. Back to work. This is the third in a series of 4" x 6" pieces inspired by collages that include words or word fragments. 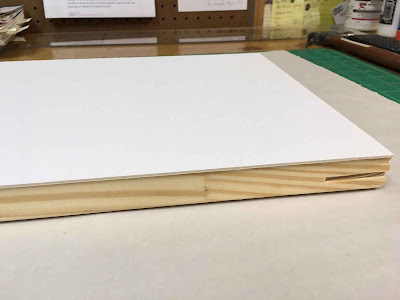 Two pieces of matboard separate this just-finished one from the one I'm about to start. Two other pieces are wound around to the back of the loom. If I get four small pieces from this warp I'll be thrilled. 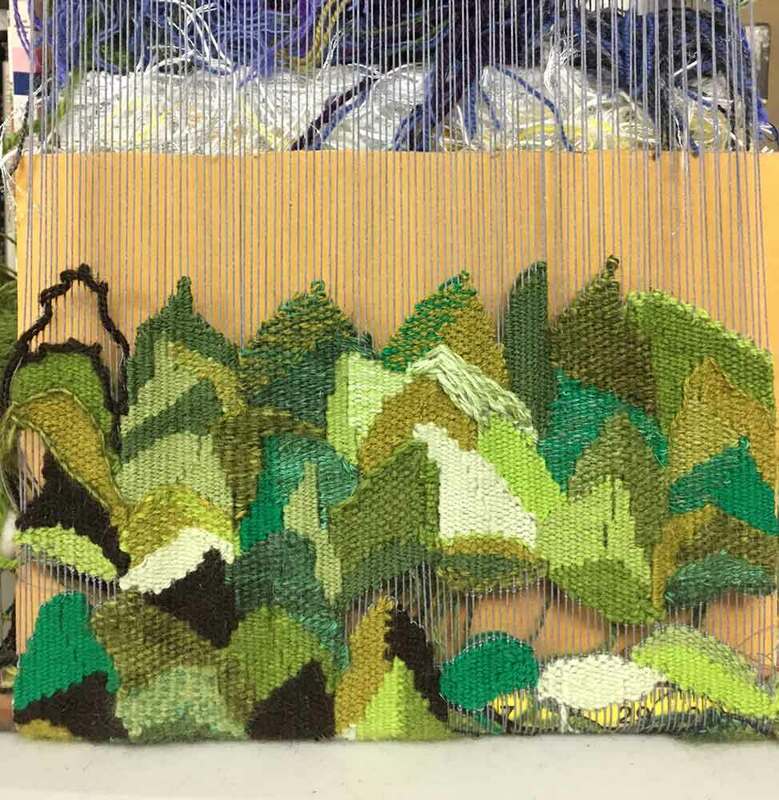 It's going to be a close call--I may have to needle in the last few passes on this next piece. 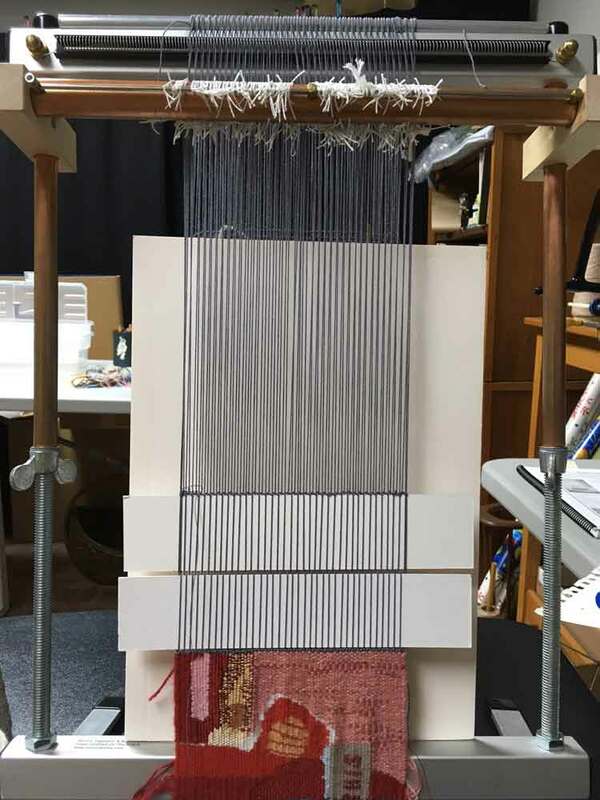 Note the warping bar perched on top of the Mirrix loom! 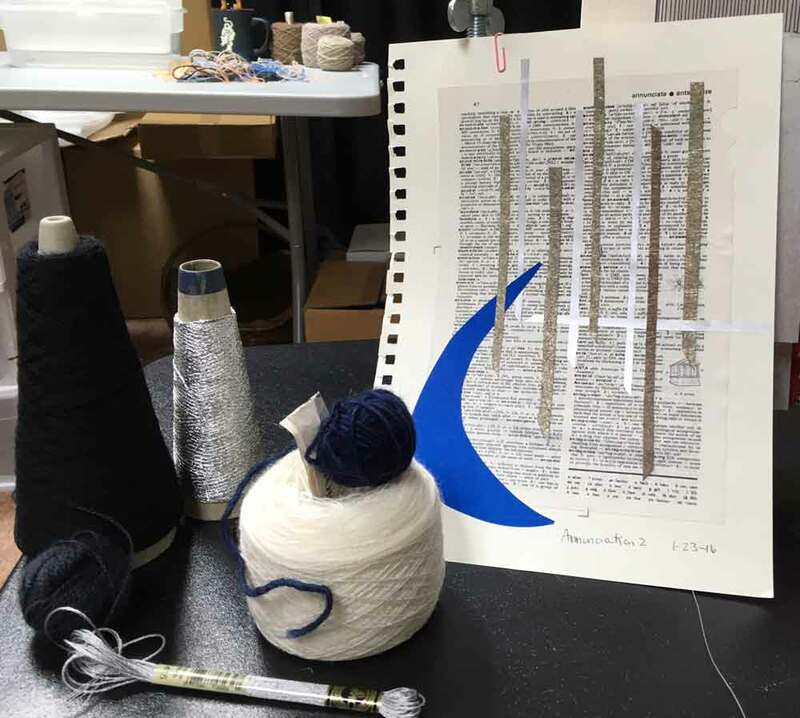 Here's the collage that inspired the next piece, and the yarns I'll use. Though I may choose a brighter blue than the indigo ball resting on the white. It'll be fun to try to weave that dictionary page in the background! I'm thinking pick-and-pick. 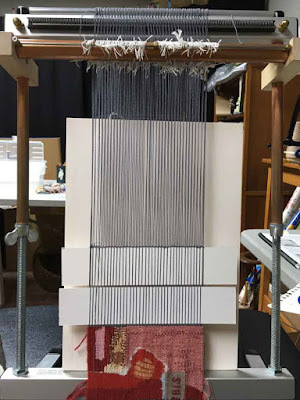 And this is the piece on the big Varpa tapestry loom. About 37" wide. 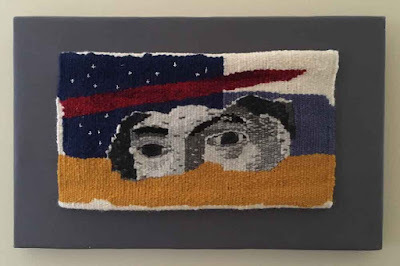 Tapestry, working title M3. (c) Molly Elkind. Another in my Mary series. So far so good. 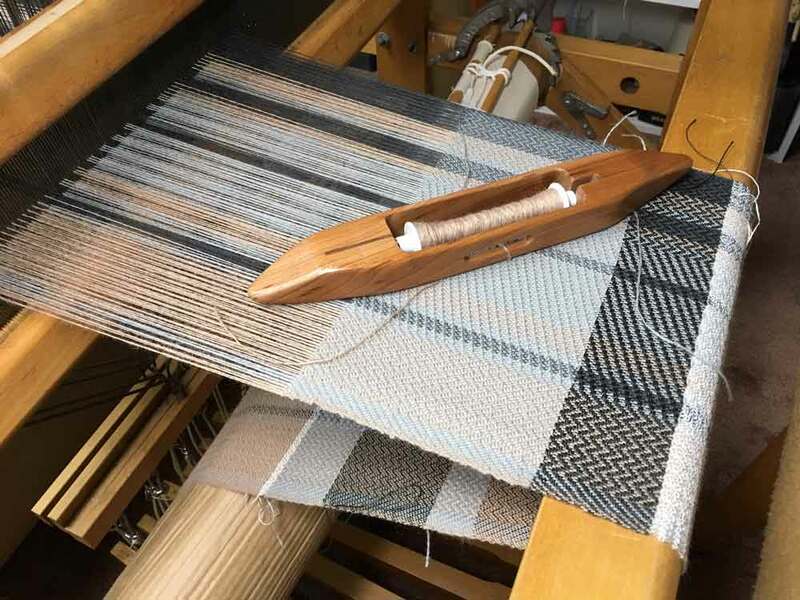 Really enjoying finally having this on the loom instead of on my design wall! Every incidence of mass murder and terrorism this summer has been noted with brown leaves rather than green. I acknowledged the anniversary of 9/11 on the far left with a hollowed-out brown outline. I've had the good fortune lately to see several exhibits that have impressed me with contemporary artists' sheer inventiveness. I saw it in three fiber exhibits at Convergence in Milwaukee (read about them here, here, and here). I also viewed the recent Vik Muniz show at the High Museum in Atlanta, and recently I had the privilege of jurying a fiber guild show as well. In each instance I was reminded that in a world saturated with images, innovation in art is essential to engage and hold our attention. The now-old modernist motto "Make it New" still holds. The casual viewer at the Muniz show might identify his use of peanut butter and jelly to re-create the Mona Lisa, or black beans to reproduce the iconic image of Che Guevara, to be the extent of Muniz' innovation. "Gee, I never would have thought to make art out of that. What will those crazy contemporary artists think of next?" 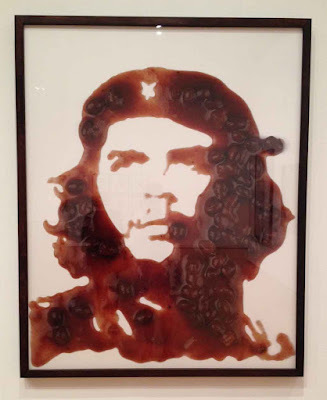 Vik Muniz, Che (Black Beans) from the After Warhol series, Chromagenic print, 2000. But I think Muniz is deeper and more thoughtful than that. Unpacking the wall label information in the caption above is one way to start. Che Guevara, the Marxist champion of the poor in Cuba and elsewhere, is rendered in the common food of the people he fought for. The image is instantly recognizable because the Alberto Korda photo on which it is based has been reproduced endlessly and become a cultural icon. Muniz's piece is part of a series called After Warhol, placing it explicitly in the lineage of Andy Warhol's famous silkscreened images of celebrities. And the piece in the show at the High is a photograph, not the actual work made of black beans. 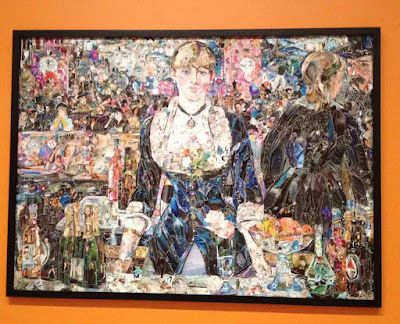 Muniz is playing with layered notions of what constitutes art--its materials, its sources, its "originality," its preciousness and permanence. He is also reclaiming an icon, an image that has become a cliche, by using a novel material, black beans, to invest it with new meaning. In another series, Muniz used garbage to create giant portraits of people who survive as garbage pickers in Brazil. Dust and debris are arranged in huge arrays on the floor of a warehouse and photographed from above. The arrangements compose images in the manner of classical works of art history. They prompt us to examine the mental categories to which we in the first world might too often consign the poor. 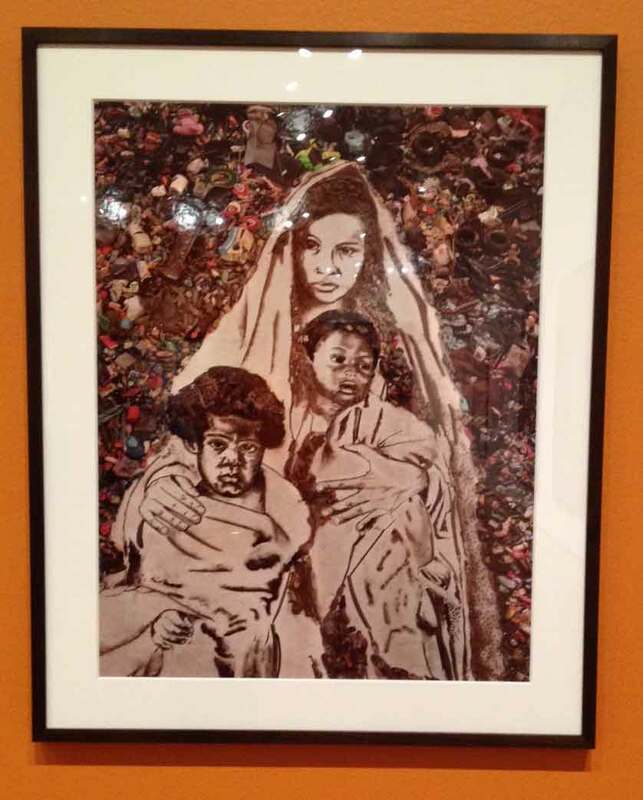 Muniz reminds us in part of his title, "(Suellen)" that these are not generic poor people, this is not a cliche peasant madonna noble in her suffering, but an actual woman with a name. 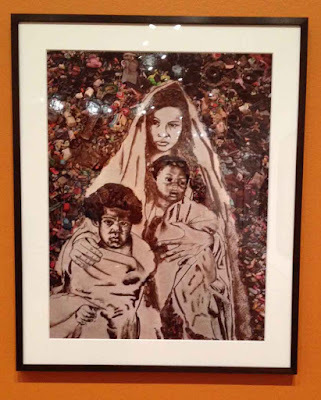 Vik Muniz, Mother and Children (Suellen) from the Pictures of Garbage series, 2008, Chromagenic print printed 2011. Here's one more. In the Pictures of Magazines series, Muniz re-created classic works of art as collages of paper torn from magazines. From a distance the work appears to be an accurate reproduction of an oft-reproduced painting. Up close, you can see deliciously witty and ironic details of advertisements and images torn from our contemporary culture. Perhaps this image of a barmaid facing her patrons who are reflected in the mirror behind her is not so dated after all. And perhaps Muniz is also commenting on the commodification of now-beloved Impressionist works that were once disruptive and controversial. from the Pictures of Magazines 2 series, 2012, Chromagenic print. Novelty purely for novelty's sake is ultimately dissatisfying. It prompts us to ask, So what? The photographer-artist I live with, my husband Sam, derides such work as "rim-shots," one-liners that can feel like a slap across the face, a throw-away line that leads nowhere. The old "shock the bourgeoisie" strategy must now reach further and further into formerly taboo subjects, materials and performances to grab our attention. When it does there is, it must be admitted, too often nothing there. In my view the novel approach should arise organically from a new idea, an emotion expressed in a fresh way. As with Muniz and other innovative contemporary artists, if we pause, look, look again, keep an open mind, and allow our thoughts to play over all that we see and glean from the label, we may begin to understand what the artist might be up to. We must slow down and simply look, first of all. The most difficult thing in the world is to listen, to see. We don’t want to see. Do you think a capitalist wants to see what is good in the communist system? Do you think a communist wants to see what is good and healthy in the capitalist system? Do you think a rich man wants to look at poor people? We don’t want to look, because if we do, we may change. We don’t want to look. If you look you lose control of the life that you are so precariously holding together. And so in order to wake up, the one thing you need the most is not energy, or strength, or youthfulness, or even great intelligence. The one thing you need most of all is the readiness to learn something new. The hardest thing for many of us is simply to slow down and look, to suspend judgment, drop our defenses, and allow ourselves to be taught. 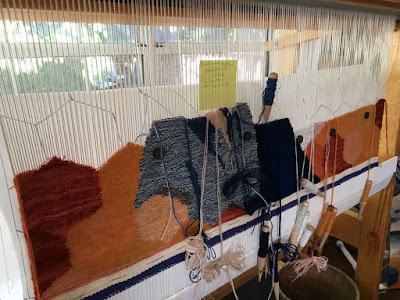 What does this mean for my work and that of other tapestry and fiber artists? Many of us are attracted to our medium in part because of its traditions and history. Yet if we want to be anything other than antiquarians shoved to the margins of the contemporary scene we need to push our work to be conceptually rigorous as well as technically good. We need to push our medium to behave in fresh ways and to say something to contemporary people at large as well as to our specific fiber tribe. A tall order. But as Sam likes to remind me, If it was easy you wouldn't be interested. PS. I'm experimenting with a larger font for this post. Let me know in the comments what you think.